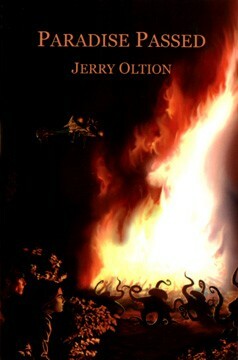 Cover art for the novel Paradise Passed, by Jerry Oltion, from Wheatland Press. 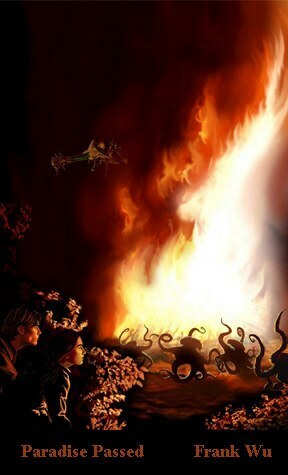 We see the two heroes watching aliens frolic by a bonfire. The engine is in front, and pulls the rest of the ship, which is attached via a tether. On the very back end of the ship are cargo pods and shuttles. In the middle is a tree, the physical and spiritual center of the ship. Interestingly, a couple months after this piece was done, a paper was published showing that real octopi sometimes "walked" on two or three legs, raising the others high up as they moved. They looked quite a bit like what I'd drawn, so that was pretty cool.